Let's start with the good news. It is now possible to regenerate bone where it has been lost and is critically needed to anchor dental implants for replacing missing teeth. You can't place dental implants into air — and herein lies the problem. The structures that overlie the upper back teeth, even in good health, are in fact air spaces, the maxillary air sinuses. Being able to create or regenerate bone in these areas, in the right place and right amount can be life changing. It makes dental implants, today's state-of-the-art tooth replacement systems, a reality for people with missing back teeth thereby restoring their ability to eat, chew, and talk. Since the back teeth also provide facial height and cheek support, individuals who receive treatment feel rejuvenated not only in chewing and smiling, but also in their ability to function in society, all of which improves health and quality of life. And what makes this possible? There is an accumulated body of evidence based on systematic research that now provides for sound biologic and surgical decision making to regenerate bone — both predictably and safely. In other words, your dental professionals have fact-based science helping them determine how they can best regenerate your bone as needed for dental implants. The size, shape and remaining bone of the maxillary sinuses influences whether you can have dental implants with or without a sinus surgical procedure. Many people who have wanted dental implants for missing upper back teeth have been disappointed in the past because they have been told that they have insufficient bone to anchor the implants. Thus, instead of receiving state-of-the-art dental implants, their usual alternatives have been removable partial or full upper dentures. To help you understand, let's start with some basics and a brief explanation of this situation. Upper back teeth are normally supported by the bone of the upper jaw or “maxilla.” Inside the maxilla are structures known as the maxillary (air) sinuses, one on either side of the upper jaw. And a sinus, most simply put, is an air space lined by a membrane. 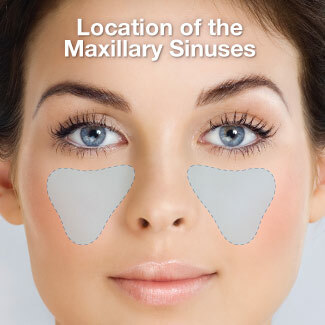 The maxillary sinuses are classically described as pyramidal in shape with their respective sides or walls located as follows: next to the nose, beneath the eye, above the palate (roof of the mouth and back teeth), and the inside of the cheek. However, they vary tremendously in shape and size from person to person and even from one side to the other in the same person. Unless special precautions are taken to prevent it, when teeth are lost, some of the bone supporting them is also lost. 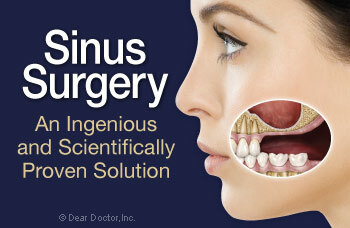 But with maxillary sinus augmentation procedures, new bone can be created so that dental implants can be anchored. These procedures basically involve lifting up the sinus membrane in the area where implants need to be placed, filling the space created with a bone grafting and/or biologically active bone generating material, allowing the body to convert it to your own new bone.